While the majority of the immigrants to New England between 1620 and 1640 were Puritans of some variety, a minority were conventional, conforming members of the Church of England, or of no particular religious persuasion at all. For example, West Country fishermen created settlements in Monhegan, Casco, and Richmond Island during the 1620s and early 1630s, accounting for (roughly) one thousand immigrants, or about five percent of the whole Great Migration. Given the small size of their initial settlement, the role of the Leiden Pilgrims is disproportionately large in the Great Migration narrative. With no more than about 250 immigrants during the 1620s, the examination of this group has consumed more paper and ink than any other event in the history of the settlement of early seventeenth-century New England. The Dorchester Company, led by the Reverend John White, was about equal in size to the Leiden Pilgrim group, and White’s followers are particularly well-defined during the 1620s; after that decade, other immigrants came from the West Country in significant numbers, but cannot always be connected with White’s activities. 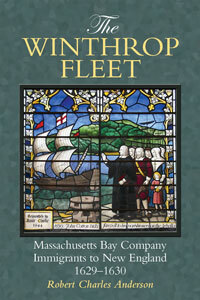 The Massachusetts Bay Company, associated most famously with John Winthrop, emerged in the last years of the 1620s, and took on many of the managerial functions of White’s Dorchester Company. The focus for recruitment of settlers shifted from the western counties to East Anglia and the environs of London, with some admixture of emigrants from Lincolnshire. The number of passengers associated with this group is about eleven hundred, or slightly more than five percent of the whole Great Migration. In 1633, William Laud, the Bishop of London, was elevated to the office of Archbishop of Canterbury, which allowed him, in concert with other like-minded bishops, to extend his pursuit of Puritans to the entire kingdom. This opened the floodgates, with the result that clerical companies formed in nearly all corners of England and made their way to New England. Although the principal motivation remained adherence to Puritan beliefs, the dynamics of migration changed from the pull of recruitment to the push of persecution. The Laudian immigrants arrived in New England mostly between 1632 and 1640, with relatively small numbers in 1632 and 1633 and perhaps twenty-five hundred a year from 1634 to 1639, with a smaller number in 1640. Therefore, this sub-segment of the Great Migration contributed as many as sixteen thousand immigrants, or about four-fifths of the whole number. This is a wonderful blog. Thank you! HOW can I find out if Thomas Manchester who came in the founding of New Haven, Ct will be included in the Great migration study? I very much appreciate the work you are doing on the great migration, documenting the individuals and families. Identifying patterns like this one is also valuable.